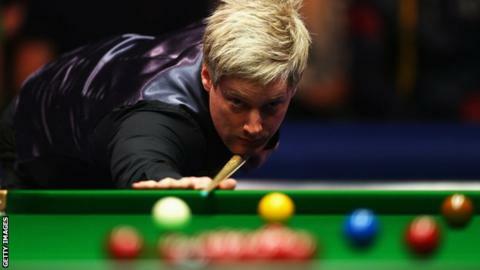 Defending champion and world number one Neil Robertson will face Ding Junhui in Sunday's China Open final. Australian Robertson, 32, reached the final with a 6-2 victory over Ali Carter, despite having struggled with a virus for much of the week. China's Ding, 27, swept aside Mike Dunn 6-0 in Saturday's other semi-final. Ding will become the first player since Stephen Hendry in 1990-91 to win five ranking events in one season if he takes the £85,000 top prize. Englishman Dunn, 42, produced the biggest win of his career by beating world number two Mark Selby to reach the semi-finals. But Ding, who has already won the Shanghai Masters,Indian Open,International Championship and German Masters this season, proved much too strong for him. Robertson, who beat Selby in the final in Beijing last year, will be aiming for his third ranking title of the season, having won the Wuxi Classic and UK Championship. "My performances have improved as the week has gone on and today was the best I have played," he said. "It has been a new experience for me to be sick during a tournament but I have kept fighting. "It will be a fantastic final against Ding. It would be nice to play him at full fitness, but I'll give it everything I have."